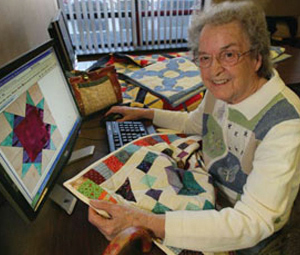 94 year old Helen doesn’t recall when she began sewing. Although she still uses the treasured thimble she received in the 1920’s, her treadle sewing machine has been replaced by a portable electric model. Today Helen still enjoys sewing aided by even newer technology. Assisted by the helping hands of our Senior Aide’s Generations On-Line coach, Helen learned how to use a computer and now finds new quilting patterns on the Internet for her next sewing project.